Are there no fundamentalists here? Just chartists? I need to get my cat to start picking stocks. I bet she can outperform most fund managers. I know a dart board can. Au contraire. For me charts are just a backup to check out trends in the fundamentals of a stock and the overall economy. On the other hand I won't argue with the cat or dartboard options in an up market. Not so sure about a down one. . Personally Paul, I hate the markets. I am not a contrarian so to speak but I just can't/don't think like most folks one way or another. Prior to switching to engineering I was a math major and economics major. I dabbled with an MBA and studied financial accounting. I get what and how the quants are doing it. We model signals the same methods. I have quant friends who are making damn good money at it. I guess I just don't have the patience for it. Did some triple top and triple bottom looks. Says take the difference between highs and lows. Then take that difference to leg down lower from triple bottom. I did this and it got me to 2466.53. To which lands you only 1.9% higher than the 2417 support level trapper spoke of and lands at about 17% down.......just shy of the big bad "bear market". Still another 4% or so down from here till we hit support. Just hope that we don't fall back to the 2016 support level. That would mean a 25% drop off highs. Well, it closed at 2506 after you posted this and the futures are pointing to a down opening today. So maybe you predicted today's closing number. Is that what you were looking for? Allow me to continue your lament. Quantitative analysts study the data, create formulas, and program computers. The computer do all the trading based on the formula programed by the quants. The computer trading generates new data driven by the transactions programmed by the quants. Quants review the new data, created by the transactions, made by the computers, programmed by the quants. Quants create new formulas based on the new data that was essentially created by the analysis of the quants. Who needs stock companies? Just let these guys keep doing math problems and reprograming the computers and that's your market. "Place your bets." I agree with you. Markets are overpriced and we were due for at least a drawdown and - it looks like now- a pullback. S&P500 index opened this morning at 2560 Next support level is at 2532 and the one below that is 2417. We won"t reach the 20% "recession" level unless it falls below 2353. US economy still in pretty good shape and still expanding albeit at a reduced rate. Treasury bond 3mo-10yr curve close to but still not inverted and Fed will do all it can to prevent it from inverting [ and theoretically thereby preventing a recession]. The recent economic slowdown in rest of world is worrisome and could eventually be problem for us also. 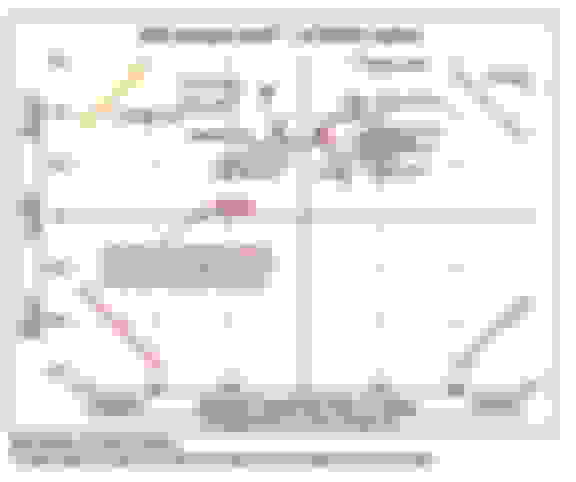 I have been following a free website that some of you might be interest in looking at occasionally. 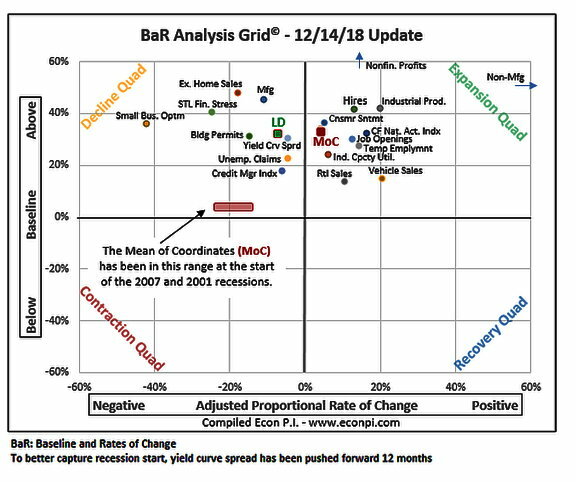 The BaR Analysis Grid© clarifies current economic conditions and signals how near the economy is to a recession. The mean of coordinates (MoC) is the average of all plotted points. It indicates the overall health of the economy. Because the average of leading indicator coordinates (LD) is now lower than the MoC, the LD is being tracked. Click here to learn how to read the BaR grid. The BaR is updated every Friday. If interested in following I suggest you visit their website [see blow] and read their methodology. It's a easy read and shouldn't take more than 15 minutes. Bill you analysis of the quants is correct but happening at least 600 times a minute. When does the directed order of automated trading devolve into something that looks for all the world like chaos? Are we there yet? Will the stock market be the first automated system over which humans lose control? Where are the fire breaks in the system? My degree in accounting gave me an exposure to finance, but that was forty years ago and my life's work has been in the infrastructure for processing and analyzing data. This is what leads me to ask these questions. Do any of you smart guys (and I use the adjective with all sincerity) have thoughts? Or are these questions too out-there for this thread? I hate them too. We got burned badly during the Great Recession. We were retired for only 1 year and lost about 40%. The experts said if you retired 1 year before or 1 year after you were screwed. Well, guess what we were. We have annuities which are guaranteed so adios stock market. My cat is pretty smart...I like this idea. If people can pick a horse in a race by it's name, my cat should do OK with the stock market. Quick Reply: Market Watch 2019.